Why is someone who lives off the grid (and an energy saving nut) talking about a dishwasher? The reality is that homesteaders and solar homesteaders don’t want to live like we are in the stone ages. Dishwashers, like clothes washers and refrigerators are a part of living in this modern age. All of us like convenience and no matter how much we romanticize about living “the simple life”. There is nothing simple about “the simple life”. Add to that, using a dishwasher might be more efficient than using your sink. If you are producing your own electricity with renewable energy, and you can spare the electricity, a dishwasher makes good sense. Dishwashers use less water (and less hot water) than using a sink. A decent dishwasher will use less than 1kWh per load. If you turn off the water heating element and electric drying element, a dishwasher will consume closer to 500 watt hours per load, not including the energy required to pump and heat the water. How to find the most efficient dishwasher? You will either need to find a dishwasher that is not a phantom load or put a timer on the circuit that powers the appliance. Locate a model that does not seem to be computerized. This will not be as easy as you might think. Almost all dishwashers use some type of computer or computers to manage the cleaning functions and the timing of each cleaning function. Any unit with a digital keypad or LCD display likely has a computer. If your dishwasher has a computer, it will use power 24 hours a day, 7 days a week. Some will use 10 or 15 watts while some use as much as 50 watts. Look for a model that either has real mechanical buttons or a real mechanical timer. Sometimes it is hard to tell if a button is mechanical or digital as they are sometimes covered in a waterproof material. The mechanical buttons will click and feel different than digital. Usually mechanical buttons and timers are reserved for the less expensive models of dishwashers. Find a dishwasher that has an “AIR DRY” option. Most dishwashers use electric elements that operate much like an electric oven to dry your dishes at the end of the cleaning cycle. 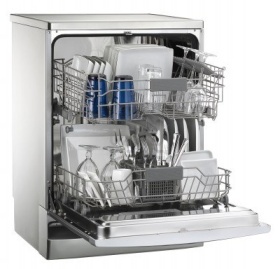 Many dishwashers operate the elements at the end of the cleaning cycle whether you want it or not. The “AIR DRY” or “ENERGY SAVER DRY” option will disable these heating elements. You can also disconnect the elements if you want to reduce the energy consumption of your existing dishwasher. This will usually work fine except in the rare occasion when your dishwasher’s computer will sense the open circuit and shut down the whole dishwasher. In that case you will have to find a low wattage resistor with the same resistance as the heating element and wire that into the circuit to fool the computer. Using the air dry feature can save 300 to 700 watt hours on an average load. Try to find a unit that has a high temperature setting that can be disabled with a switch. Most dishwashers have water heating elements that activate if the water temperature inside the dishwasher gets too low. You may not even know your dishwasher operates in this manner but most most do. Some have a switch to deactivate these elements. It is usually referred to as “HIGH TEMPERATURE WASH” or “TEMPERATURE BOOST”. Disabling these heating elements can save 400 to 900 watt hours per load. Only operate your dishwasher when the unit is 100% full. Use the least aggressive setting that still washes the dishes effectively. This setting is usually called “LIGHT WASH”. Using the “POTS AND PANS” setting will make the dishwasher run longer and hotter using more water and more electricity. Open the hot tap/faucet closest the dishwasher until the water is very hot. All dishwashers will heat the water to an effective washing temperature during operation. If you feed the dishwasher with cold water, the dishwasher’s heating elements will heat it up. If you feed the dishwasher with hot water, the electric elements will remain off. If you have plenty of solar electricity it won’t matter how much electricity is consumed and you can ignore this recommendation. What brand do you have or recomend, specifically? I was hoping to find an article here about washing machines for off grid. Any suggestions would be much appreciated. Nice article! Do you know of any brands that make non-computerized dishwashers?